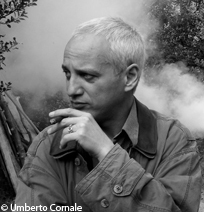 An Italian composer born November 8, 1960 in Roma. Giuliano D’Angiolini studied composition at the Rome Conservatory, ethnomusicology at Rome University and the Accademia Chigiana in Sienna, as well as computer music in Padua. A musicologist and ethnomusicologist, he is the author of many writings on medieval music, music of the various oral traditions and contemporary music; he has also recorded broadcasts for Italian Radio. In his compositions Giuliano D’Angiolini has preferred smaller groupings and is interested in sound per se and its development, rejecting any kind of narrative and formal writing. His works include Ho visto un incidente (1992) first performed by Marie Kobayashi at the Italian Institute in Paris; Encore chorals (1998) premiered by the Ictus Ensemble at the Abbey of Royaumont during the Voix Nouvelles festival; Notturno in progressione (2004) first performed by the Parisii Quartet; Orizzonte fisso, bordoni mobili (2007) given its premiere by the ensemble 2e2m at the Présences festival; Scomposizione del moto ondoso (2010). Giuliano D'Angiolini was born in Rome in 1960. He studied composition at the Santa Cecilia Conservatory in Rome under the direction of Aldo Clementi, and with Boris Porena at the Associazione Culturale Arcadia. From 1980 to 1982 he enriched his musical training by studying ethnomusicology at the ‘La Sapienza’ University in Rome and the Accademia Chigiana in Sienna. His teachers were Diego Carpitella, Jean-Jacques Nattiez, Ivan Vandor, Simha Arom and Gilbert Rouget. In 1983 he followed Karlheinz Stockhausen’s classes in Rome, then in 1986 he studied computer music at the Centro di Sonologia Computazionale in Padua. From 1993 to 1996, in Paris, he was artistic director of the Festival of contemporary Italian music at the Italian Institute, and then worked in residence at the CCMIX from 1997 to 1998. As a musicologist, Giuliano D'Angiolini has published many writings in periodicals and collective works on the music of the Middle Ages, contemporary music and music of various oral traditions. He is notably the author of two studies of Karlheinz Stockhausen in the periodical Analyse Musicale. As an ethnomusicologist he has recorded many broadcasts on the music of Flanders and Burgundy from the late Middle Ages for Italian Radio. He made and provided commentaries for a recording of Greek music (Musique de l'Île de Karpathos, Buda Records, 1996) then a CD-book on the same subject (A giorno nella gioia, l'indomani nel pianto: La musica dell'isola di Karpathos, Nota, Geos, 2007) and has also published work on Italian and Sardinian vocal music. His passion for medieval music and for certain types of traditional music lies at the heart of some of his own works. His approach has led him to develop music that he terms impersonal, music from which any kind of development or form is banished. He takes an interest in low-grade musical material, in smooth structures, thereby evincing a predilection for non-narrative, non-evolving music. Sound, for Giuliano D'Angiolini, is significant in itself and requires both time and space to be perceived. A musical composition is thus like a window that opens out onto a landscape, whichever it may be. His works are played by many ensembles such as Alter Ego, Cairn, Chrysalide Ensemble, 2e2m, Factus, Le Banquet, Ensemble Modern, the Parisii Quartet, Art Zoyd, and at leading festivals: Ars Musica, Aujourd'hui Musiques, Festival d'Automne, Présences, Voix Nouvelles. His works include: Ho visto un incidente (1992) to poems of Sandro Penna, first performed by Marie Kobayashi at the Italian Cultural Institute in Paris; Poliouchka, poliana (1996) for instrumental ensemble, premiered by the ensemble Le Banquet at the Centre Georges-Pompidou in Paris; Encore chorals (1998) for violin, viola, cello, piano and radiophonic noises, first performed by the Ictus Ensemble at the Abbey of Royaumont during the Voix Nouvelles festival; In saeculum for violin and prepared piano, based on two motets from the Codex Bamberg (2001); Notturno in progressione (2004) for string quartet, premiered by the Parisii Quartet; Di questo passo (2004) for strings and electronic instruments; Orizzonte fisso, bordoni mobili (2007), premiered by the ensemble 2e2m at the Présences festival; Motivetto (2009) for a variable group; 7 flauti – 16'56" (2010) for 7 flutes; Scomposizione del moto ondoso (2010) for string quartet. Les partitions de Giuliano D’Angiolini sont inédites. D'ANGIOLINI Giuliano. Tierkreis, œuvre pour instrument mélodique et/ou harmonique : un tournant dans le parcours musical de Stockhausen. Analyse musicale, 1989, no 14, p. 68-73. D'ANGIOLINI Giuliano. Le son du sens : Machaut, Stockhausen. Analyse musicale, 1987, no 9, p. 43-51.